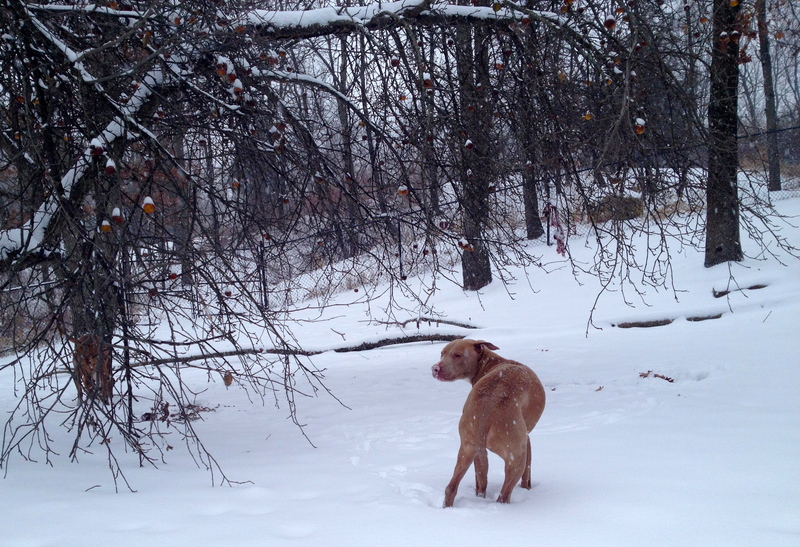 Have you ever seen a Peaches eating apples in the snow? 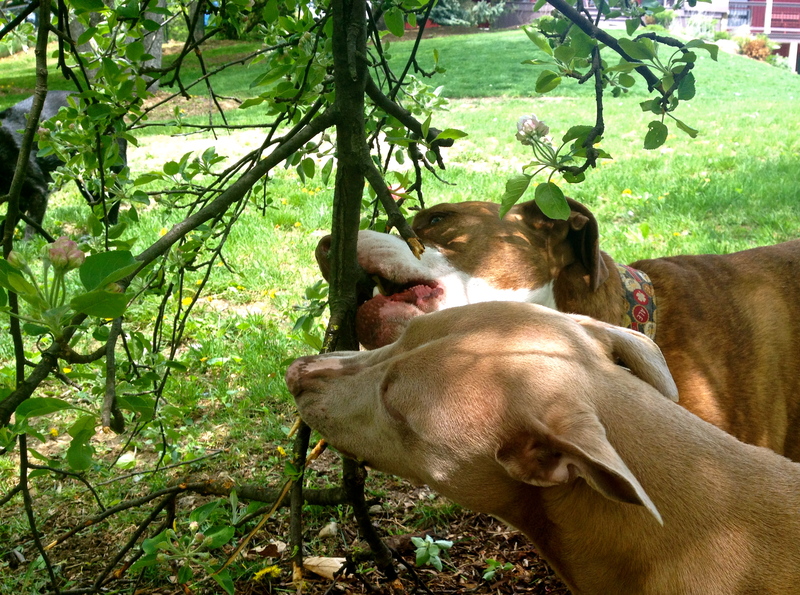 We have an old, unmaintained and soon-to-be unwieldy apple tree in our back yard that has become the centerpiece of all outdoor dog activity at our home over the last year. 2013 was a serious bumper crop for Michigan apple growers–yielding around 30 million bushels–and our tree was no exception. 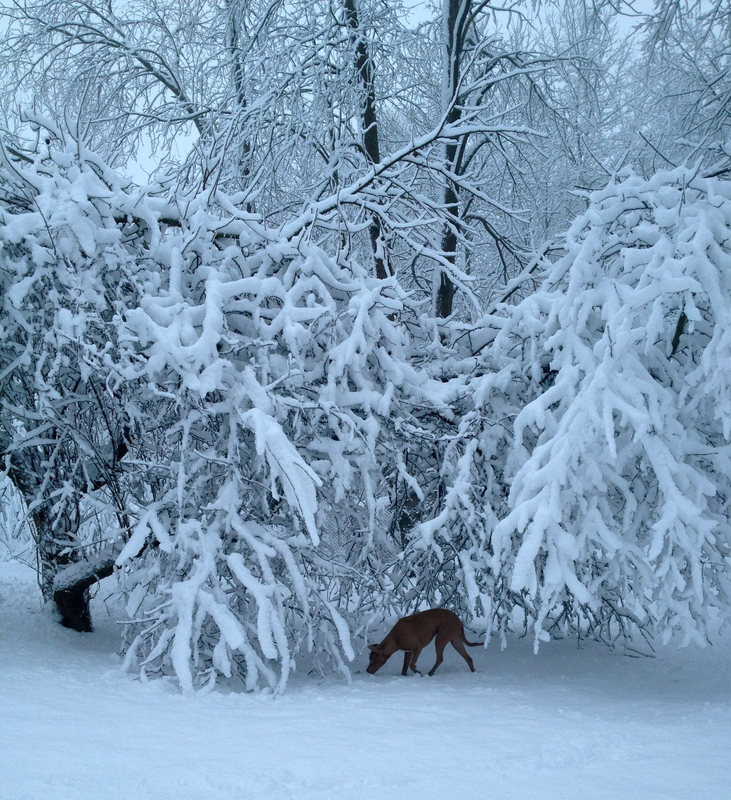 Our dogs have spent spring, summer, fall and now a chilly, snow-packed winter huddled under the apple tree snacking on blossom-filled branches, snatching pre-ripened fruit off the limbs, stuffing their faces from the edible red carpet below, and mining for crunchy treasure in the snow. A couple weeks ago one of the few frozen apples left on the tree fell off and hit me in the head creating a sensation that I could only liken to being beaned with a baseball from a few feet away. The pain was impressive, not that an apple to the head would register with any of these tail-wagging blockheads. 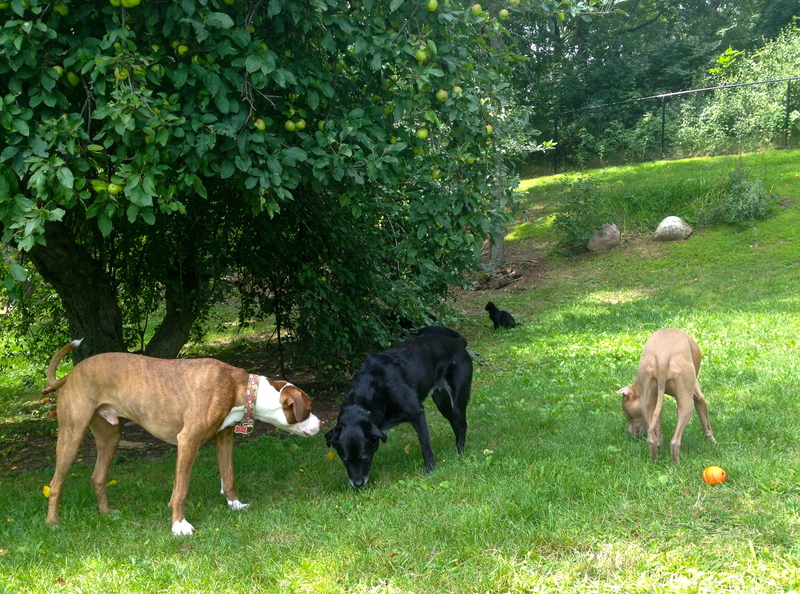 But of all the activities that our private tree of life inspires, my two favorites are Peaches’ apple munching ears and Buster’s apple picking antics featured in the following video. 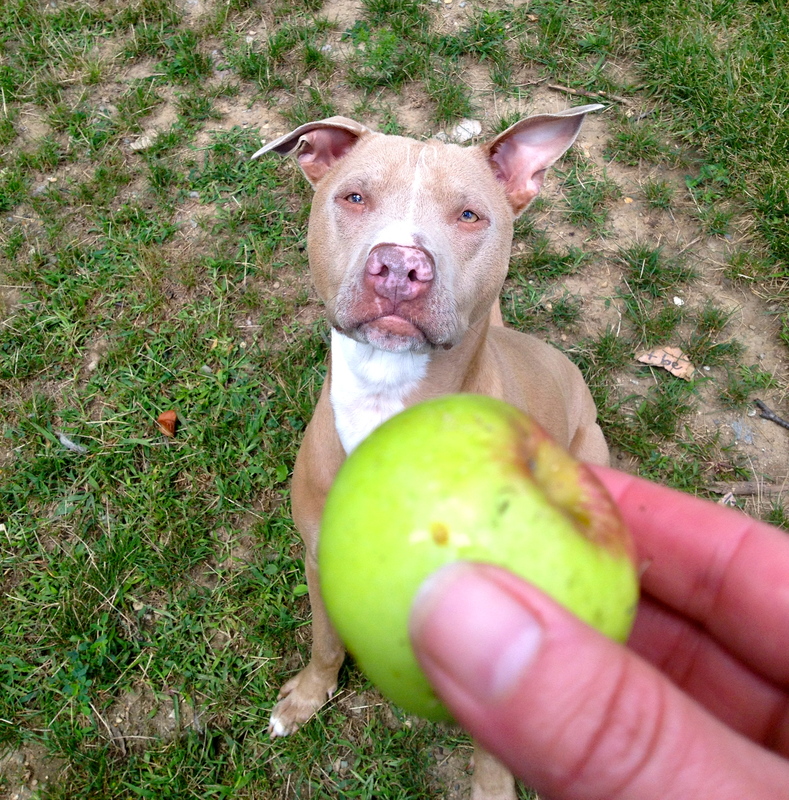 An apple a day keeps the canines at play. 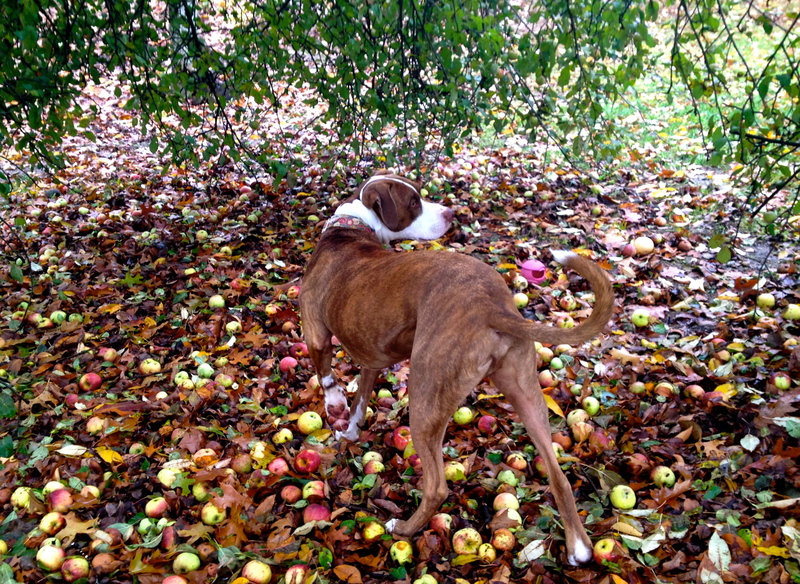 This entry was posted in Dog play, Fun Stuff, Videos and tagged apple farmers, apple season, apple tree, apples, bumper apple crop, dog behavior, dog photos, dog play, dog treats, dog videos, dogs, frozen food, fruit trees, michigan apples, michigan winter, peaches the pit bull, pit bull ears, rescue dogs, seasons, tree of life, under the apple tree. Bookmark the permalink. We have 2 plums, and our neighbors have an apple, pear and apricot that fall partially in our yard. Since the day we moved in, our dogs have all become fruit bats. It is not unusual to find a partially eat pear or apple in the house, and needless to say, bowel movements are quite regular! I think it’s so funny when I hear people say that dogs only like meat! Peaches ears……melt. And her tiny munches! Buster as the wild young boy. Love it, as always.